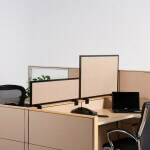 Higher cubicle walls or cubicle height extenders may well be a mandate instead of an option in certain situations. While many offices have shifted to an open office layout, cubicles are still the mode of choice for quite a few industries, and amongst these are several with ties to medicine. HIPPA constraints changed the way medical companies, providers, vendors and more conduct their offices. The need for privacy under ethical grounds meant that the shift towards open office design had to be scaled down, as records went digital and computers took over. Today, a space being repurposed for use in the medical industry – such as billing or coding companies involved with medical insurance and so on – needs some modicum of security and privacy to ensure patient’s rights are not being compromised. Cubicle height extenders can help. They provide a barrier of sorts that requires more effort to circumvent, prevent passersby from seeing monitor screens or paperwork on the desk, and also keep telephone conversations from being as public – especially if sound absorbing material is used in the cubicles. In addition to the positives for keeping patient information confidential, cubicle height extenders can improve employee relations by keeping chatterboxes from ruining the workdays of the more focused. There’s another advantage to cubicle height extenders. Undesirable employee behaviors that appear to spread in open office environments can be quelled in cubicle areas by raising the height of the walls, creating less opportunities for the bad apples to spoil the rest of the bunch. Gossip is harder when you have to get up and go round a corner and approach someone from behind to share it. You don’t have lose visual and auditory channels, however – the great thing about cubicle height extenders is that they can be used judiciously, allowing you to fashion partitions that allow collaboration where appropriate and privacy when needed. Consider how cubicle height extenders could benefit your office workers by giving them privacy and space when dealing with sensitive subjects and material, and allowing more freedom when indicated for those who need a more open layout to function well.